BabyBlueOnline: Kangaroo Court now in session? Living Church has published a letter from Bishop Dorsey Henderson o the Episcopal Disciplinary Panel for Bishops following the resignation of the "church attorney" Josephine Hicks. 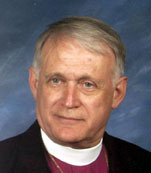 Bishop Henderson announces that he has "made a command decision" (never a good sign by the way in a democracy) and appointed a new church attorney, one who has all ready been working on taking Bishop Mark Lawrence down as bishop of the Episcopal Diocese of South Carolina. Suddenly, according to Bishop Henderson "time is of an essence" in following the same pattern to remove a sitting diocesan bishop from office. And why is time is of an essence, when as the Anglican Curmudgeon points out, the last time the old Title IV had a full meeting was actually by teleconference last November 10 when no charges were brought forward against Bishop Lawrence. Since then there has been silence until the recent actions of the "new" Title IV committee. Bishop Henderson serviced on the old Title IV and now chairs the new Title IV. In his letter to the Disciplinary Panel Bishop Henderson says the new church attorney actually did "preliminary work on the Bishop Lawrence information," when he served in a similar capacity on the old Title IV committee. Anglican Curmudgeon raises serious concerns regarding this appointment in his post today, "The Kangaroo Court Should Resign in Toto," which you may read here. Why did the old Title IV meet nearly a year ago and do nothing when apparently they did address the actions in the Episcopal Diocese of South Carolina and chose not to do anything for nearly a year? What it a strategic decision that the committee knew that they could not move forward to remove Bishop Lawrence from his office under the old Title IV procedures and so waited to get Bishop Lawrence after the the new Title IV committee was established? Does this seem right to you? Why is a year of no action followed suddenly by Bishop Henderson writing that "time is of an essence?" Why is looking like a sudden rush to judgment? "the new Title IV is unconstitutional in two key respects: it usurps the exclusive constitutional authority given to dioceses for the trial of priests and deacons and it gives the Presiding Bishop unprecedented and unconstitutional authority over diocesan bishops." The "church" in the Episcopal tradition in the United States was centered on the diocese, around a bishop. Here in Virginia, one of the founding dioceses of The Episcopal Church this is very clear. It took the American Revolution to separate "the Church" (i.e., the Church of Virginia) from the Commonwealth government. Until the Revolution, "the Church" (i.e. the Church of Virginia) was united with the government of the Commonwealth of Virginia. Following the Revolution, the two were separated. The Commonwealth helped create the new United States, while the Church went on to become the new Diocese of Virginia. Not all the congregation in the Church of Virginia joined in the fray, especially with so many congregations around the Commonwealth so cautious about reintroducing to Virginia part of England's historical propensity to turn their bishops into Lords. They had just spent many years getting rid of them and were in no mood to bring them all back to their former glory. Each of the new dioceses at some point needed to be recognized by the Archbishop of Canterbury. Not all were. According to Robert Prichard at Virginia Theological Seminary when he spoke to the Region VII Council of the Diocese of Virginia a few years ago, a group in Massachusetts (see here) wanted to be recognized by the Archbishop of Canterbury and become part of the Episcopal Church but were turned down by Canterbury since they did not believe in the doctrine of the Trinity. That group of once-Anglican churches went on to establish the Unitarian Church. 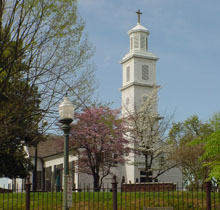 St. John's Church in Richmond. The Diocese of Virginia then joined with other founding dioceses in a general convention and created the Episcopal Church. But the center of "the Church" was never the Presiding Bishop (and why she is intentionally a Presiding Bishop and not an Archbishop, there would have been no way the Church of Virginia would have signed on to having an Archbishop over them after having fought and won a war to free themselves from aristocratic tyranny - Patrick Henry gave his famous "Give me Liberty or Give Me Death speech in St. John's Church in Richmond) nor was it 815, nor was it even General Convention. The old Title IV understood that. This is what I was taught in my confirmation classes in Virginia. Episcopal polity meant to have authority centered in the local bishop. Such a view was difficult for the majority of Anglicans in Virginia and many of them resisted having bishops - this was true in my family's hometown of Buckingham County, Virginia where the local Anglican church became and remains Baptist. So the new Title IV canons are a major revision, designed to make The Episcopal Church the "communion" (and not the diocesan bishops are in communion with the Archbishop of Canterbury) and centralize authority away from the dioceses, their congregations and their bishop and redirect the center to 815 with its special interest groups and the Presiding Bishop. It's a major change and it might be in the laity's best interest to understand that under the new Title IV canons anyone now can make charges (and not even be identified publicly) against a bishop and have the bishop removed no matter what the diocese and its congregations might say. Think about it. This is the best explanation of the problem with The new Title 1V Canons I have read. I hope all my friends in TEC read it and indeed "Think about it". In his flawed analogy Andy equates the Episcopal church with communist Russia. How absurd. A better analogy would be the good old US of A. The States joined the Union freely, not by conquest, and once joined would not be allowed to depart. Changes to the US Constitution would be allowed and all the States would be required to comply, sometimes reluctantly it must be said. There! That's a truer analogy.